Guys, when I was drawing them being all fat, this song came on my playlist. I lost it! I really like these comics of the Floyd Brigade painting the town red. I’m also really curious about what Floyd was going to paint. Oh no, don’t call them the Floyd Brigade around Ecta, or Davis… or even Floyd. He’s fine with taking charge, but he’d hate the idea and the pressure of being officially declared the leader. I think floyd was about to paint himself on the door. . .
love the Ecta as a shoe to walk on the grass! hilarious! Thanks! Originally I was going to have her looking forlornly at her ghost tail while everyone else was having fun, but then I thought, she’s much more resourceful and determined than that! I can ALMOST think that I can read the description of that painting! Surely it hold vital information regarding the history of Idenau, the First, and a complete dissection of the symbolic meaning behind the artwork. And of course, all the information Skærva has ever needed to know about the Gods. I like the new look for the princes… much better… I also think ecta ate to much, she kinda let loose didn’t she. Yeah, this is the happiest I’ve ever seen her! OH GOSH. This has too much awesome in it. Thanks! It was certainly a fun one to draw. Those chubbers. I’m surprised you didn’t have them taking candy away from a baby. We had to abridge their adventures somewhat! Only so much wickedness you can fit into one comic. NOT THE ORPHANAGE… FOR PUPPIES! OMG I just saw something… the princess looks like she is farting… but then I remembered that girls don’t fart… that’s why they bloat. Out of all of this my favorite thing are the little fish toes. I love how the waitress totally expected something like a dine and ditch. I mean even if you didn’t judge them by their species there is the fact floyd put back on the skarva clip thing, totally giving away who they worked for. 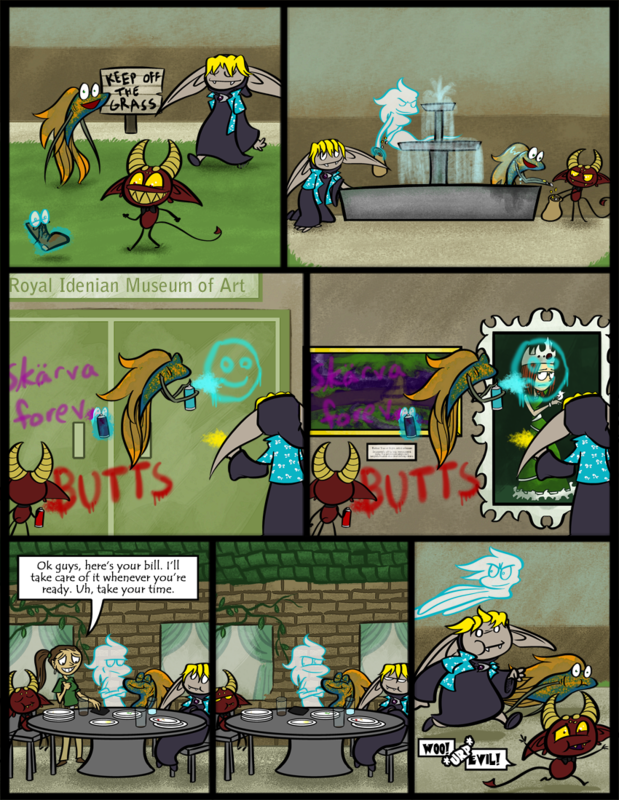 The entire comic was enjoyable, i can only imagine what the royal family is thinking considering hundreds of other minions are doing this sorta stuff at the same time. Perhaps they left a tip though, maybe with some of the coins they stole from the fountain. I imagine they have sympathy for the average worker. And she did a pretty good job clearing plates away – imagine how many would have been there otherwise! Looks at water fountain* Couldn’t ecta have possessed all the coins (Not individually) and put them into the bag? Oh well. What, ian moved with tnt?